Quite the insipid performance by the Sharks in their 2-1 overtime win against the St. Louis Blues. After coming off a blowout loss to the Kings, I expected a bit more heart tonight. There wasn’t much intelligence either. The Sharks had over 40 shots for the second straight game with the final shot clock being 44-29, but like so many times last year, shots were taken with no traffic in front of the goalie. Chris Mason saw every shot that came to him and didn’t give up many rebounds. Instead of planting themselves right in Mason’s eyes, they’d stay off to the side waiting for a rebound off his pads. That’s just being lazy and cowardly. Maybe Dan Boyle getting hit in the face with the puck earlier in the game got to them, but that’s not an excuse. For the first time in years, Patrick Marleau was playing really bad. His passes were off the mark and careless. He just didn’t have it. However, he made up for it with in the third period with the game-tying goal. It came off a one-timer from the point that deflected past Mason. Not too long after that, the Sharks had a fantastic chance to take the lead. The puck flew into the air after a shot, landed behind Mason and was just asking to be slammed home. Barret Jackman, defenseman for the Blues, put his hand over the puck to keep it out — a penalty that should be rewarded with a penalty shot. Of course the referees didn’t see it despite one being right behind the net. Karma’s gotta kick in though right? It would in overtime. Dany Heatley found himself on a breakaway with a minute left in the extra frame; he sped away from defenders and buried it in the twine. That was all fine and dandy, but the four minutes before that, the Sharks played to not lose. I’ve mentioned it before, but something is going on with this prevent defense in overtime. I’d like to know if its coach Todd McLellan’s philosophy or just the players being too tentative. The fans actually started to boo them, which was spectacular. At least they recognize it as well. This isn’t the way to rebound from a bad loss, but it’s a starting point. And the Sharks better speed up to the finish line because there’s a showdown with Detroit on Saturday. So I realized the other day I’ve been spelling Todd McLellan’s name wrong. I’ve been spelling it with an extra ‘C’ because I saw it like that when he first became coach. I don’t know where I saw it, but it’s stuck with me. My brain’s been so used to it, I’ve not noticed the correct spelling. Well, something clicked and I saw it yesterday. I verified it, and now I feel like an idiot. Mistakes happen to everyone I guess. He’s been getting good amounts of ice time on the power play lately. Not just seconds at the end either. He’s been playing with Marleau and Heatley. It’s been a good combination as he complements their talent with hard work and determination. Jody Shelley dropped the gloves with Cam Janssen, in the second period, for a 90 second slugfest. Jersey jabs galore and a few attempted haymakers. Shelley handled Cam pretty well and earned the win. Hit-O-Meter: SJ 29 StL 23; Devin Setoguchi led with five. Giveaways: SJ 20 StL 6; Yikes. That’s a scary statistic. Detroit comes to town on Saturday. 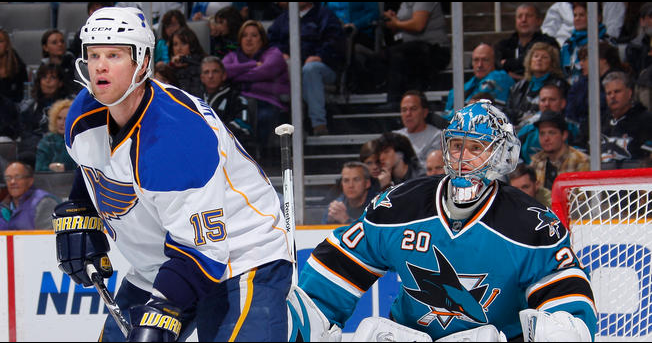 Quite the steal-and-run performance by the Sharks in their 3-1 win against the St. Louis Blues. The Sharks were outworked on every part of the ice, but goalie Evgeni Nabokov stole a victory for his team. I can’t remember the last time the Sharks were this badly outshot (39-17) and still came out with a win. But your goalie has to keep you in games and sometimes steal some. I wouldn’t say Nabby stood on his head though. Despite the huge number of shots, most of them weren’t clear shots at the net. A lot of the times the puck would deflect off someone, and roll around the crease before Nabby covered it. The game featured a lot of big hits and intensity. Devin Setoguchi plowed two Blues players — Roman Polak in the first and T.J. Oshie in the third. The Blues dished it back in the form of a fight, which was one-sided. Cam Janssen dropped the gloves with Brad Staubitz and Janssen whooped Bitz. No contest at all. The fight did help spark the Blues as they scored off a bank-shot late in the first. Unfortunately for the Blues, this game was decided in 16 seconds; that’s all it took for the Sharks to score two goals. They came in the second period; Dany Heatley deked around a Blues defender and beat Chris Mason. Right after that, the Blues turned it over to a waiting Manny Malhotra, who shot the puck off Mason, and Ortmeyer batted in the rebound. That’s about all the offense the Sharks could muster, except for the empty net goal by Joe Thornton at the very end. Two of the three goals were on the power play, so that is still hot on the road. Once again the Sharks’ third period was weak. I wish I had a good explanation for this. Maybe they’re getting tired out there; their best period is the second, so maybe they’re wearing themselves out? I’m not sure. I would love to get in the locker room and ask coach Todd McClellan what’s up with that. But again, the game belonged to Nabby. This is the front end of a back-to-back, and he’ll probably start again tomorrow against Chicago. Blues owner Dave Checketts ripped the team yesterday for their weak play. That obviously played a huge part in the emotion St. Louis played with tonight. I wonder what Checketts thinks right now about this loss. Gotta be tough, but I concede the Blues deserved this one. But in order to become that elite team, you have to win ugly. Not sure if the Blues have learned that yet. 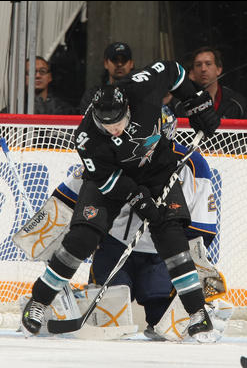 Hit-O-Meter: SJ 26 STL 18; Patrick Marleau led with four hits, while Seto, Heater and Douglas Murray added three each. I saw Jamie McGinn on the penalty kill tonight. Can’t say I’ve seen him there before, but it’s good he’s getting rewarded for his hustle. That kid might be Scott Nichol, Jr. I forgot to mention last game that Torrey Mitchell was reassigned to Worcester for conditioning. Big step for Torrey. Hopefully he gets his legs under him quickly. The Sharks travel to Chicago tomorrow to take on the Blackhawks. Should be an entertaining match. The Sharks take on the Ducks tonight at Anaheim and it should be a bruising contest. In an interesting roster move, The Sharks sent Jamie McGinn down to Worcester and brought up Frazer McLaren, who is known as a tough guy. After all the things I’ve heard from coaches about playing their own game and not worrying about the other team, this throws it for a loop. Frazer McLaren giving a Canuck "the business"
So much for playing a speedy, offensive affair as the Sharks are known to do; they plan on adapting to Anaheim’s slower, hit-filled game. I guess it’s worth a shot considering our fast style didn’t work in the playoffs last year. But alas, it’s only one player. We’ll see the effects at 10 p.m. eastern. 2. Will Marleau-Pavelski-Clowe line continue their first game performance? 3. Any chemistry from Thornton or Heatley? 4. Who starts in goal for Anaheim? Giguere or Hiller? Last years division winners in the Western Conference (Detroit, Vancouver, San Jose) are off to a combined 0-5 start. Detroit was swept by St. Louis, while Vancouver dropped a game in Calgary and was shutout by upstart Colorado today. 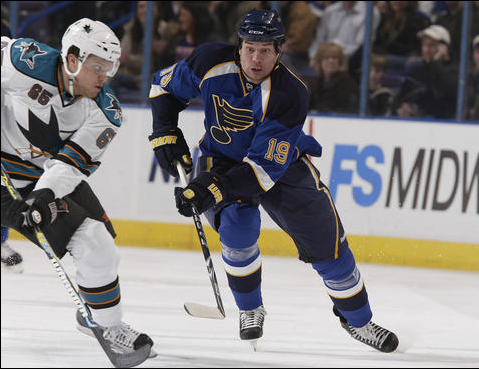 St. Louis will be dangerous — so long as Keith Tkachuk and Paul Kariya stay healthy. They already have four goals combined in two games; however, one of them will get injured this year — it never fails. Detroit’s backup Jimmy Howard played in the second game and looked, to put it lightly, sub-par. He allowed to goals in 13 seconds. I really don’t think he will ever be ready for the NHL; he’s a full-time AHLer.